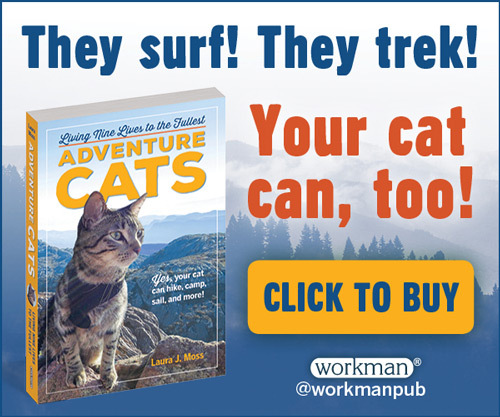 Could your cat be an adventure cat? 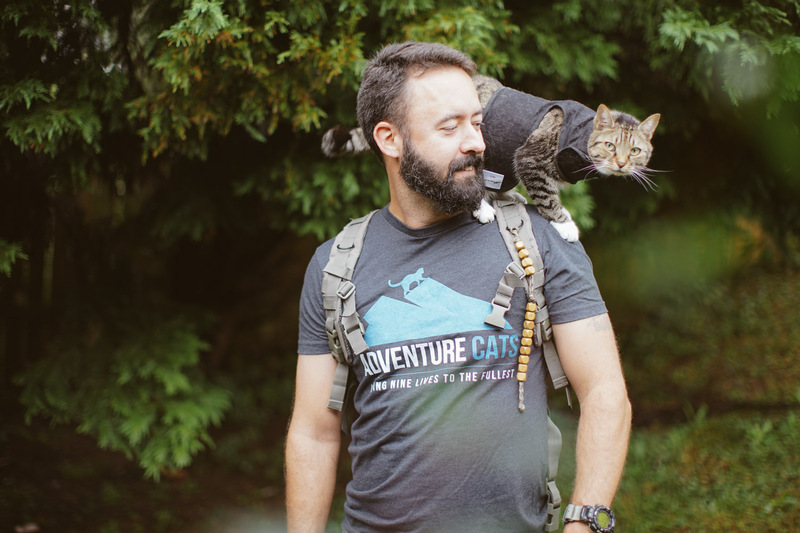 If you’ve been inspired by our Instagram or the badass cats who came before like Burma and Millie, then you’re likely wondering if your kitty could also join you on hikes, paddles, climbs or simply strolls around the neighborhood. The short answer is yes, it’s possible. For the long answer, keep reading. Just as every person is different, so is every cat. You likely have friends who love being physically active and spending time outdoors, but you probably also have friends who’d sooner join you for a root canal than a camping trip — and as much as you’d love for them to share some s’mores, you have to respect their wishes. The same goes for your kitty. Each cat has a unique personality, but just as you may identify as an ENFP or INFJ, we can also attempt to categorize felines according to their personality traits. The ASPCA has nine “feline-alities” that the organization’s shelters employ to help match potential adopters with the right cats for their lifestyles. Shelters that use these personality profiles as part of the Meet Your Match Program have demonstrated a 40 percent to 45 percent increase in adoptions and a 45 percent to 50 percent decrease in cat returns and euthanasia. The ASPCA divides cats’ personalities into three color categories — green, orange and purple — that are determined by the cat’s playfulness, how the cat responds to new people and situations and how much the cat enjoys being petted and held. Green cats are described as “savvy, unflappable and adventurous,” orange kitties are considered “good company,” and purple felines “seek affection, are pretty quiet and tend to stay out of trouble,” according to the ASPCA. While there are surely exceptions to the rule, purple cats (Private Investigator, Secret Admirer and Love Bug) probably aren’t the best fit for accompanying you on a hike. These cats are cautious and often keep to themselves, and being taken outside can be incredibly stressful for them. 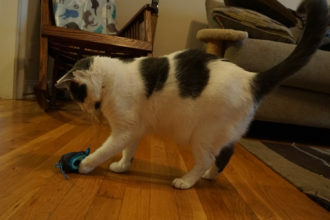 Green kitties (MVP, Party Animal and Leader of the Band) are considered high-valiant feline-alities — meaning they tend to adapt well to new situations — and are some of the best matches for a more adventurous lifestyle. Read more about the ASPCA’s feline-alities and determine which one best describes your kitty. 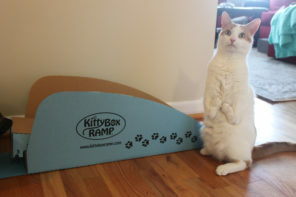 Think your cat has what it takes? In addition to personality, look at your cat’s behavior. Does he spend hours staring outside, pawing at the window and watching birds and insects? Does she try to dash out the door every time it opens? 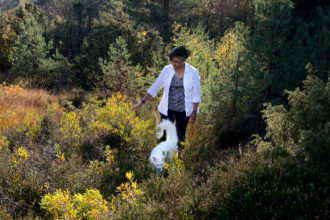 If so, your cat may really enjoy engaging with the natural world. 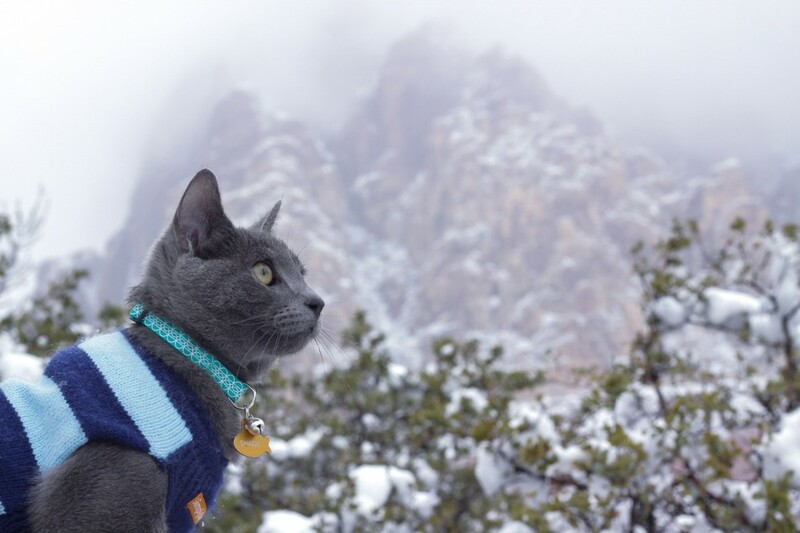 If you think your cat is a good match for joining you in the great outdoors, that’s pawsome! If not, it’s ameowzing that you recognize that. 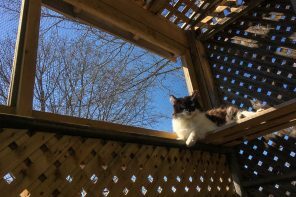 Instead of strapping on a harness, let your kitty enjoy the outside world from a window seat or even in his very own catio. 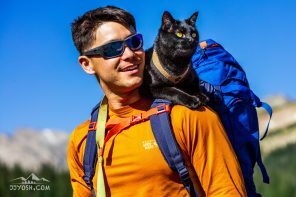 Now that you know where your kitty stands, it’s time to take the next step — and no, that next step isn’t wrestling your cat into a harness and hiking the AT. It’s finding the right harness and doing some leash training. 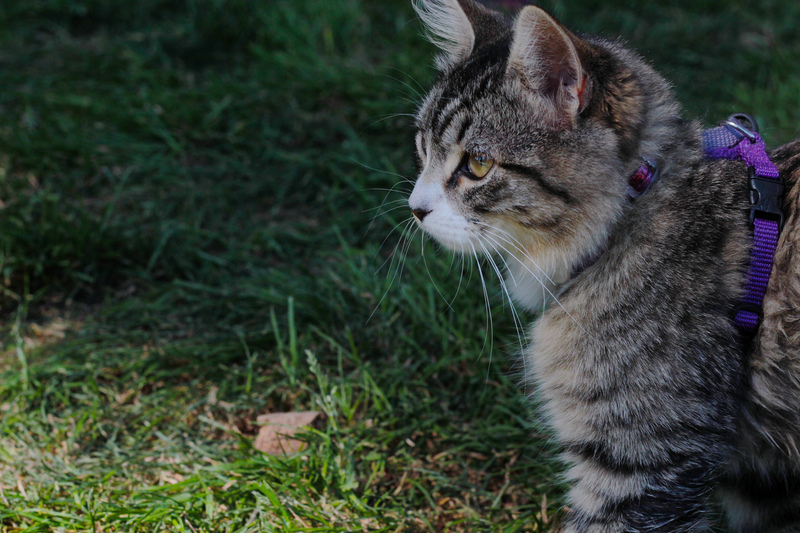 The safest way for your cat to explore the outdoors is on a leash, but even if you’ve got a fearless Leader of the Band, that doesn’t necessarily mean your cat is going to take to a harness and leash. We have a step-by-step a leash-training guide, but Miller suggests taking a smaller step first. After practicing some indoor harness walking, you can then introduce your cat to a quiet space outdoors to see how he or she does. It’s best to take things slowly and not force your cat into a brand new and potentially frightening situation. Keep in mind that kittens may be easier to harness train as they’re more open to new experiences — they don’t know any different! However, older kitties that have been inside all their lives may take more training, and some may never adapt to walking on a leash. 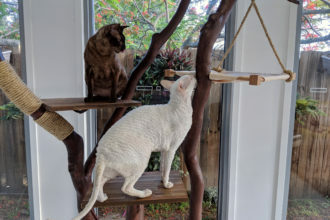 I only started leash training my two indoor cats when one was 4 years old and the other was 3. One is most definitely a Leader of the Band, and I suspect the other is a Sidekick. They’re both clicker trained, and they both adapted quickly to their harnesses. However, as much as they’re fascinated by the outdoors, they’re still occasionally spooked by sudden noises like passing motorcycles. While they may eventually join me for easy day hikes, for now they’re content sniffing around the yard and munching on grass. If that’s as much as they want to adventure, that’s fine with me. Just like when we’re indoors — my cats are making the calls. “You can’t force a cat to be an adventure cat,” said Erin Verplaetse, Quandary Q Lotus Lady’s human. “It’s definitely not something you want to throw your skittish adult cat into. If you want a furry, purring adventure buddy, my advice would be to start when they are young and open to exploration being a part of their lives. What feline-ality best describes your cat? How has he or she taken to a harness and leash? Let us know in the comments. My cat is about 7 now, but she was a stray when we took her in and you can tell she loves the outdoors… She is probably somewhere in the orange or green area, but my concern is that she doesn’t like to be held. 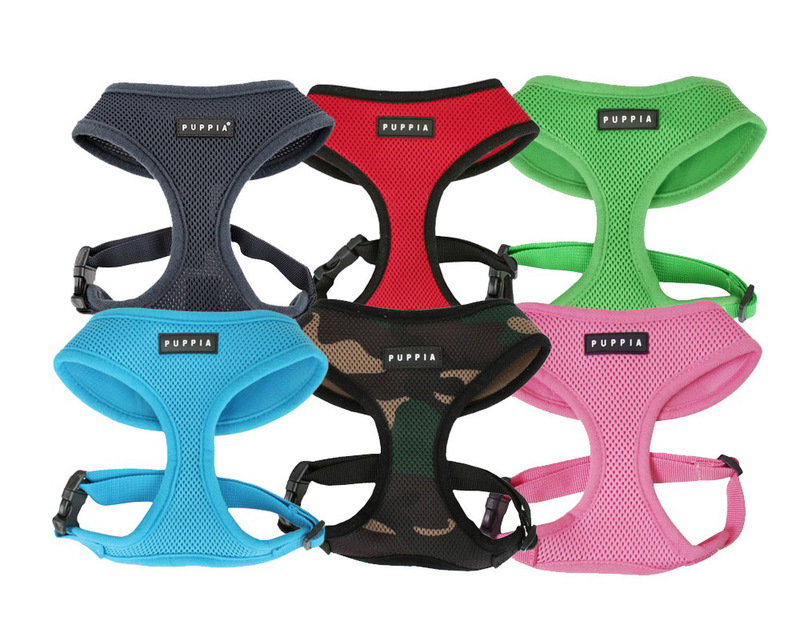 I’m sure I could get her used to a harness and what not, but holding her or having her in a pack when she gets tired on long trips may not go over very well… Any tips? Should I stick to short trips? I just adopted a 3 year old that was found in a feral colony but we are sure was a pet when he was younger…he is an excellent pet. He does long to go out and took to the harness well but when I took him outside he growled at me anytime I touched him (he was smelling flowers. He didn’t tug at his harness but I got concerned and picked him up to take him in. That didn’t go well. I’m thinking he was just overstimulated. Any tips? My cat is 4 years old, and a calico. She is stubborn to get around with if she is in her harness, and she always wanders in other people’s backyards. Her goal is to get the harness off, but I am not sure if it is just the effects of her first time having a harness on. May someone please answer/reply? Thanks. I’m from England where leashes for cats hasn’t quite caught on…we just put in a cat flap and let them roam where and when they will. If they are fully outdoor cats, would one still need to harness train to take them with you on adventures, or would it be better to just whistle train them to come back when you need them? I am so glad I found your website. Very helpful and well documented! Looking forward to try to make my cat an adventure cat :).